Spas provide the perfect space to pamper yourself, and New Mexico is home to some of the best. Whether you like to soak, steam, or sauna, have a massage or a mud wrap, or sit in a hot mineral spring to rejuvenate, your body, mind and spirit will thank you after some time at one of these relaxing oases of tranquility in New Mexico. An historic lodge high in the Sacramento Mountains of the south-central part of the state is the setting for a relaxing day or weekend of pampering from head-to-toe. A great way to acclimate to the 9,000-foot elevation is to book one of the massage packages and unwind. It’s 90 minutes of sheer bliss. 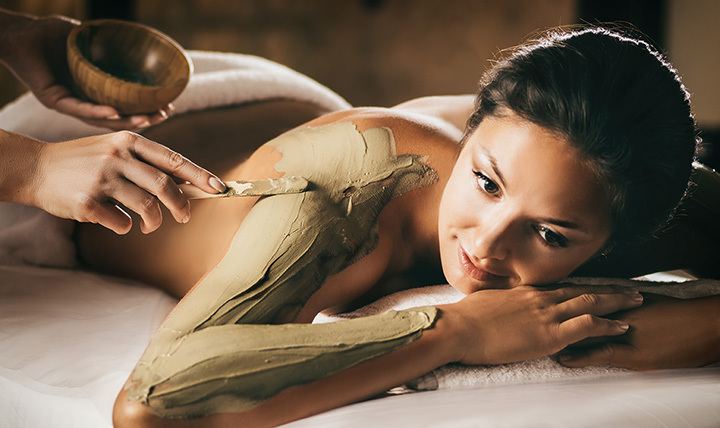 The possibilities include a hydrating mud with herbal wrap massage, salt glow with herbal wrap and the raindrop technique that combines massage techniques with a rainfall of essential oils up and down the spine, as well as the application of a warm compress that helps boost immune response and relieve muscular tension. These are worth the drive up the mountain. Step into this hidden jewel tucked away on a tree-lined street and the outside world drifts away. Put on the robe and sandals and check your troubles in the changing room. The intent, to provide a wellness retreat for visitors, is in evidence in the array of soothing modalities they offer—Swedish, deep tissue, sports, pregnancy, Thai and sinus relief massage. All treatments incorporate all natural products. The hot tubs allow for co-ed soaking (bathing suits required), as well as women or men only, plus a private tub. Consistently named as Albuquerque’s “Best Day Spa” in community publications, this is the place to go to unwind. Health through water, that’s the Latin translation of salus per aquas which creates the acronym SPA. As one of the first natural health resorts in the country, the 11 pools have been a place of mind, body and spirit healing since 1916. This is the only hot springs in the world in which you can soak in four different types of geothermal mineral waters— Lithia, iron, soda and arsenic—all with unique healing properties. Pools are Sulphur-free and range in temperatures from 80 to 109 degrees. Combine a soak with one of the spa treatments that includes massage and bodywork, skin care and restorative body therapies. Private soaking tub and outdoor soak pools available. This tranquil retreat is on the banks of the Jemez River in the lovely red rock San Diego Canyon in the Jemez Valley. The geothermal springs have been a source of healing for hundreds of years to native peoples—the main bathhouse first went up in the late 1800s. It’s run by a local non-profit and operated by the Village of Jemez Springs which funnels the funds raised by its operation back into the village. Take a cool or hot mineral soak in one of the eight oversized, private cement bath tubs filled with 100 percent naturally occurring mineral water. Add in a healing massage in one of the private treatment rooms and nurture the health and well-being of your entire being. A visit to this peaceful oasis of well-being high in the Sangre de Cristo Mountains brings with it the harmony that comes from the uniting of mental, emotional, physical and spiritual wellness through rejuvenating and restorative therapies. Take a soak in the natural, spring-fed magnesium-based tub and you’ll feel the stress of the day seep away. Swim in the private outdoor pool that overlooks the serenity of the 70-acre grounds. Try the Native American Blue Corn and prickly pear salt scrub for a unique way to rid the body of impurities. It’s unlike anything you’ve ever experienced anywhere else. Massage is designed to promote relaxation and well-being. The owners of this spa know how to use massage to uplift the body, mind and spirit to create good health. From Swe-dish to deep tissue to shiatsu to hot stone, their team of massage practitioners are experienced and highly trained. Put yourself in their hands and you’ll feel transformed. Go with a friend and enjoy the view of the lake while nimble fingers knead the stress right out in a couples massage. You can also have a masseur or masseuse come to you at your convenience. This 4,200-square-foot spat is located on the Center for Ageless Living campus south of Albuquerque, but is open to the public. The spa includes an outdoor heated mineral pool, two hot tubs, steam rooms, sauna and seven treatment rooms. The services are extensive and include a variety of massages including deep tissue, lymphatic, kinesio, TMJ relief along the neck, shoulders and back and one specific to the needs of athletes that incorporates heat therapy and stretching techniques. They even offer a face and body massage that’s designed for the mom-to-be. A visit here will heal your body, quiet your mind and restore your spirit. The art of relaxation is what’s practiced here, and there’s a myriad of ways the experts at this enchanting haven put that practice into service. Experts in massage, body treatments and hydrotherapy soaks are on-hand to ensure a revitalizing experience. Many of the treatments integrate local and indigenous products. The Santa Fe chocolate chile wrap is a custom blend of warming Chimayo red chile, rich chocolate full of antioxidants, marine algae and moisturizers that nourish and hydrate the skin. The piéce de resistance is a massage application of chocolatey cocoa butter. A truly Southwestern moment that’s available to overnight guests or those just there for the day. In the tradition of Japanese bathhouses, Scandinavian saunas and Russian steam rooms, this is a place to go to enjoy a communal spa experience (swim suit required). You can soak in the solar-heated hot tub or sweat in the cedar sauna or cool off with a cold plunge in the pool. You can also treat yourself to a therapeutic massage, foot treatment, exfoliating scrub, aromatherapy treatment and a hot compress therapy, all which leave you energized and stress-free. A bliss-filled setting where you least expect it … right in town. Come here and get pampered from head-to-toe. Soak in the hot tub or spend some time detoxifying in the sauna and afterward lounge in the tea room or sunbathe in the inner yard. The variety of massages include medical, sports, deep tissue, cranial sacral, lym-phatic, myofascial, neuromuscular, pregnancy and a cozy couples experience. There’s something for everyone, including specials for children.